Exemplary dealer training and customer service response by USA hot tub and swim spa manufacturer Marquis have helped to achieve the top ratings and number one spot in a respected industry assessment report. 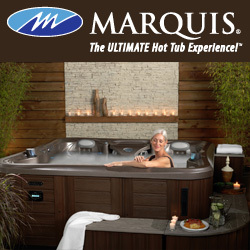 The only employee-owned hot tub manufacturer in the world; which produces the iconic Marquis models for its ‘dealer direct’ service that includes the cutting-edge Vector21 options, Aquatic Training Vessels (ATV™ swim spas), and Water Rejuvenation Products personal hydrotherapy spas; received an industry top total score from the 2017 TradeCertified Report on dealer network assessments of hot tub manufacturers. This ‘Number One Rating’ for Marquis by independent dealers across North America places the company at the top of the hot tub industry among 18 national brands tested. Among the TradeCertified results, Marquis finished in the top three brands in nine out of 12 categories of assessment. This covered topics from products and quality, to customer service and operations, and to marketing. For the sixth time in the last seven years Marquis was ranked ‘Number One’ overall in ‘Customer Service Responsiveness’. The Oregon-based company, which is famed for its ‘Make A Wish’ exploits involving donations of hot tubs and swims spas, has also achieved the top spot ranking in ‘Dealer Training’ for 2017. Marquis Corp President John Schrenk has welcomed the prestigious verdict of coming out as ‘Number One’ with the top rating results, as well as highlighting the efforts of the whole team of employee-owners for helping to achieve the industry recognition. Like many of its leading manufacturing counterparts, Marquis has been among the major sales success stories and has been celebrating record global sales performance by its international dealer network; which incorporates leading UK retailers including WhatSpa? Approved Billinghay-based 1Stop Spas, Aberystwyth-based Welsh Hot Tubs, and Bridgend-based Bos Leisure. Not content to rest on its laurels, Marquis has boosted its dealer options in the last couple of years with the introduction of the Vector21 hot tub range, which is being promoted in an advertising campaign in the latest edition of WhatSpa? magazine with the declaration that the ‘future of hot tubs is now’. Coming in at 239 x 239 x 91cm and incorporating the V-O-L-T hydrotherapy system and Whitewater-4 deep tissue footwell jet, the eight-seater V94 has been singled out as being the ‘top pick’ of the Vector21 range in the 2017 WhatSpa? Best Buy Awards. The three-seater Spirit and six-seater Epic have also gained 2017 WhatSpa? Best Buy Award accolades in the respective £7,500 to £9,999 price category, and over £15,000 category of the consumer magazine. On the swim spa front, Marquis has certainly been making a splash in the market with a number of state-of-the-art ATV options endorsed by six-time Ironman World Champion Dave Scott; including the ATV-14 Sport and ATV-17 Kona, which have been bestowed with WhatSwimSpa? Best Buy Awards in the respective £15,000 to £24,999, price bracket; and over £25,000 price category. The WhatSwimSpa? Verdict declares that the ATV-17 Kona provides a ‘serious bit of kit for those that want to emulate the triathlon performance of the great Dave Scott’. “I see great potential for a wide variety of effective workouts as people turn to ATVs for training,” divulged Dave Scott. “ATVs take the old school swim spas idea and improve it.